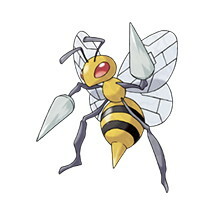 This page contains all the information available for Beedrill in Pokemon Ultra Sun and Moon including the moves learnt by level up, egg moves and TM moves. Swarm Powers up Bug-type moves when the Pokémon’s HP is low. Sniper Powers up moves if they become critical hits when attacking. Sun and Moon Evolve Kakuna.